New, reinforced helmets and body armor currently being fielded to the military represent just the tip of the iceberg in terms of what is on the drawing board for protecting warfighters of the future. The future fighting force will have far superior protective systems that provide enhanced capabilities while imposing less weight on the user. U.S. Army Soldier Systems Center at Natick, MA conducts research and product development for all the military services. Engineers are looking at new materials and composites that offer enhanced protection with less weight. The Marine Corps is fielding a new helmet that, thanks to new materials, offers 6-percent more fragmentation protection and the ability to stop 9 mm rounds. The helmet, weighing a little more than 3 pounds, about a half-pound less than the previous Kevlar helmet, introduced in the early 1980s. A similar but somewhat streamlined helmet developed by the Army for special operations forces, the modular integrated communication helmet, also provides increased ballistic protection. Army officials expressed "tremendous interest" in fielding the new helmet to other forward-deployed troops. Looking a decade down the road, warfighters' helmets are expected to become even more impenetrable to enemy rounds, while offering an array of added protections. The objective force warrior program integrates thermal sensors, video cameras and chemical and biological sensors within the helmet. It also includes a visor that can act as a "heads-up display monitor" equivalent to two 17-inch computer monitors in front of the wearer's eyes. The program is a "system of systems" the Army is developing for warfighters in 2010 and beyond. New technology is also improving warfighters' body-armor systems. The new Interceptor body-armor system is in wide use by soldiers and Marines in Afghanistan and Iraq, where it is saving lives left and right. The vest, which the Marine Corps began fielding in late 1999, includes two 4-pound inserts that protect the vital organs against 9 mm submachine-gun fire at point-blank range. The vest also includes removable flaps that cover the groin, throat and neck. Lightweight boron-carbide protective plates make the Interceptor weigh a little more than 16 pounds, compared to 25 pounds for the flak jacket, the previous body armor. Natick officials are exploring different materials and composites of materials that will provide increased ballistic protection while shedding as many as 6 more pounds from the vest. Sixteen pounds is still too heavy. The goal is to get a one-third to one-half reduction in weight -- under 10 pounds would be more reasonable. The body-armor system being developed for the objective force warrior program incorporates next-generation boron-carbide ceramic plates that will weigh 10- to 30-percent less than those in the Interceptor, while delivering equal or greater protection. New construction processes are being explored to shape the plates so they fit more snugly against the chest and spine. Natick officials also plan to replace the 20-plus layers of Kevlar in the Interceptor vest with a new M-5 fiber that will weight about one-third less. The self-adjusting vest will position the protective plates about 2 inches from the torso, to reduce chest injuries or bruising in the event that the wearer takes a hit. The goal is to create a protective system that is lower profile, lower bulk and lower weight. It should be like a second skin, so the warfighter barely even knows that it's there, but that offers the protections needed in a combat environment. The same vest that keeps out bullets keeps in heat: During warm weather, police find them almost unbearably hot. Wearing body armor in hot climates, particularly for long periods, is physiologically stressful and can compromise the wearers' efficiency. In some cases the wearer may be inclined to remove the armor. An under armor cooling system has been developed and found to be effective in maintaining the wearer's body temperature at safe levels. The system consists of a shirt that has cooling channeled embedded and a heat exchanger that allows circulation of water to provide cooling as needed. A thermostatically controlled valve allows the water to either bypass the heat exchanger or to go through it as required. The heat exchanger consists of a one or two liter (selectable) bladder that contains frozen water. The cooling liquid circulates through the heat exchanger as needed. The bladder is worn on the back as a typical camelback pack. Recommendations provided by users in operational scenarios are being incorporated into an upgrade of the cooling system's design. The resultant system will be lightweight and will provide comfort to wearers. It is expected to provide cooling for up to several hours without having to replace the cooling media. 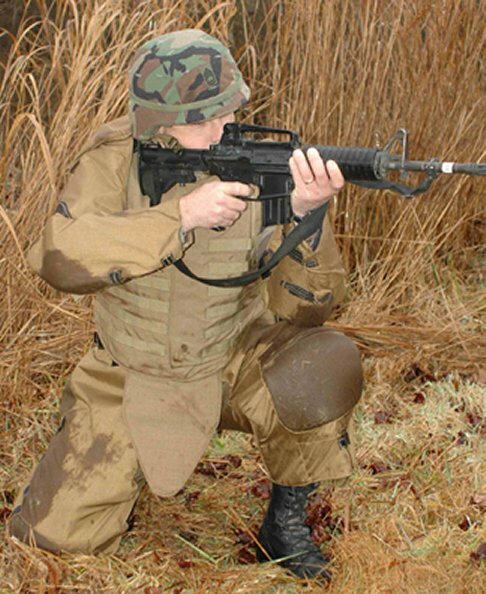 Liquid armor for Kevlar vests is one of the newest technologies being developed in 2004 at the U.S. Army Research Laboratory to save Soldiers' lives. 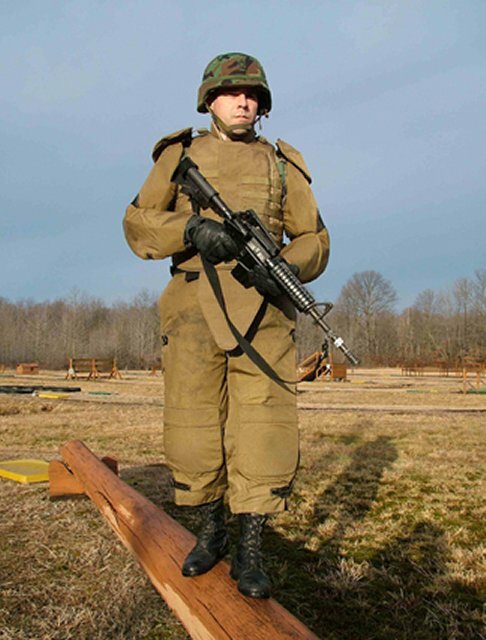 This type of body armor is light and flexible, which allows soldiers to be more mobile and won't hinder an individual from running or aiming his or her weapon. The key component of liquid armor is a shear thickening fluid. STF is composed of hard particles suspended in a liquid. The liquid, polyethylene glycol, is non-toxic, and can withstand a wide range of temperatures. Hard, nano-particles of silica are the other components of STF. This combination of flowable and hard components results in a material with unusual properties. During normal handling, the STF is very deformable and flows like a liquid. 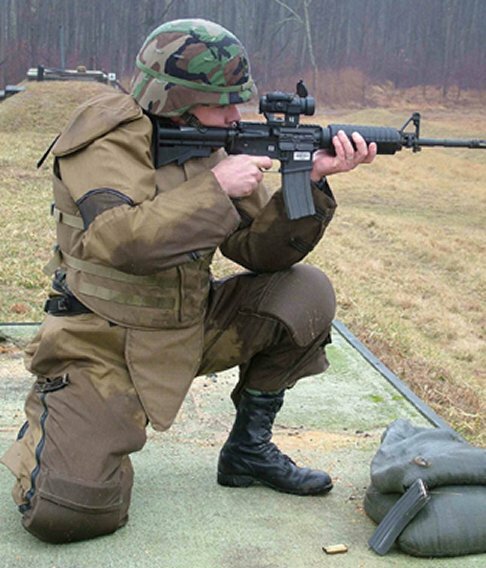 However, once a bullet or frag hits the vest, it transitions to a rigid material, which prevents the projectile from penetrating the Soldier's body. 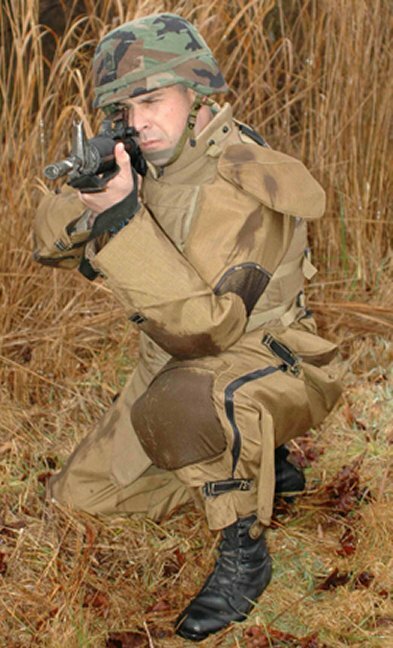 To make liquid armor, STF is soaked into all layers of the Kevlar vest. The Kevlar fabric holds the STF in place, and also helps to stop the bullet. The saturated fabric can be soaked, draped, and sewn just like any other fabric. The Natick team has been working on this technology since 2001. The goal of the technology is to create a new material that is low cost and lightweight which offers equivalent or superior ballistic properties as compared to current Kevlar fabric, but has more flexibility and less thickness. Liquid armor is still undergoing laboratory tests, but researchers are enthusiastic about other applications that the technology might be applied to. The idea would first be to put this material in a soldier's sleeves and pants, areas that aren't protected by ballistic vests but need to remain flexible. The material could also be used for bomb blankets, to cover suspicious packages or unexploded ordnance. Liquid armor could even be applied to jump boots, so that they would stiffen during impact to support Soldiers' ankles. Three-dimensional woven, braided or stitched fibrous assemblies are textile architectures having fibers oriented so that both the in-plane and transverse tows are interlocked to form an integrated structure that has a unit cell with comparable dimensions in the all three orthogonal directions. This integrated architecture provides improved stiffness and strength in the transverse direction and impedes the separation of in-plane layers in comparison to traditional two-dimensional fabrics. Recent automated manufacturing techniques have substantially reduced costs and significantly improved the potential for large-scale production. Optimal orientations, fiber combinations and distributions of yarns have yet to be fully developed and perfected for 3D fabrics subjected to impact loading conditions. Current body armor rely ceramic plates to defeat penetrators. The rigidity and brittleness of these materials limit their use to only the torso of the war fighter. In addition, over time, environmental degradation and inadvertent drops damage the ceramic and render it ineffective. So that ample movement is still possible, innovative concepts that combine hybrid 3D fabrics with other materials such as ceramic and possible new nanoscale materials are needed. Optimal combinations of these materials need to be determined along with new methodologies to ascertain how to utilize inherent mechanisms (friction, microcracking, fiberbreakage, fiber bridging, etcÉ) of these systems for energy dissipation and strengthening. 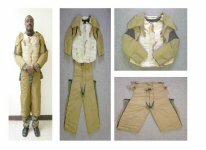 By early 2005 Naval Research Laboratory researchers had developed new flexible arm and leg protective armor for marines and soldiers optimizing blast protection, mobility, weight and comfort. This armor could be useful for vehicle crews, breaching parties in urban operations, security and support operations, sentry and checkpoint duty, and roadside patrols. The armor is designed to reduce the likelihood of severe injuries by protecting against the large number of smaller blast fragments generated by blast weapons and improvised explosive devices. It provides NIJ Level IIA protection to meet this fragmentation objective, while also providing protection against blast pressure waves and thermal flash. Each arm guard weighs 1.6 pounds and attaches to the standard Interceptor armor vest. The pants weight 6.5 pounds including suspenders. The cost is estimated at $1000 per set in full-scale production. Current efforts are focused on scaling-up production and more extensive evaluation by interested units and warfighters in operational and training environments. Options for higher levels of protection are also available. NRL, the Army Research Laboratory, FS Technology and Oklahoma State University produced this design. They combined information on blast weapon characteristics, combat casualty trends, advice from the military medical communities treating injured soldiers from Operations Enduring Freedom and Iraqi Freedom, soft armor materials ballistic testing, and warfighter feedback. The program is funded by the Office of Naval Research's "Tech Solutions" program office.